SAN FRANCISCO, USA: Apple's plan to build a verdant new campus crowned with a shimmering flying-saucer shaped headquarters was cleared for 'lift-off' Tuesday, 15 October. Officials in Silicon Valley's Cupertino, which has long been home to the culture-changing technology company, unanimously endorsed a grand idea put in motion years ago by Apple co-founder , the late Steve Jobs. In documents filed with the city, "Apple Campus 2" is described as a 21st Century creation designed for research, collaboration, and innovation. "This new development will provide a serene environment reflecting Apple's brand values of innovation, ease of use and beauty," Apple said in paperwork filed for approval by the city. 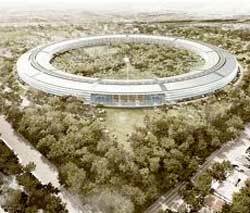 Apple enlisted renowned architect Norman Foster to transform a 176-acre site dominated by asphalt and old buildings into a sustainable, state-of-the-art office, research and development facility. "The majority of space will be greenery, but the eye-catching jewel of the campus promised to be a glimmering ring of polished metal and glass mirroring the design passion put into Apple's coveted devices," the company said. "The entire campus, indoors and out, is intended to promote shared creativity and collaboration and spur invention for the next several generations of Apple products," the company added. According to the design specifications the four-storey main building will have about 2.8m feet2 of space and be able to accommodate 12,000 employees. The list of campus amenities included a striking restaurant and a separate fitness centre with about 100,000 feet2of space. Campus plans promised a landscape design of meadows and woodlands that will create an ecologically rich oak savanna reminiscent of the early Santa Clara Valley. Apple said that it will continue to use the One Infinite Loop campus a short distance away, which is its current headquarters. "The main objective of the project is to redevelop the site with a new, unified, secure and private Apple campus," the company said in the plan filed with the city. Apple has a powerful presence in Cupertino, a city with a population of about 58,000 people located located near the Santa Cruz Mountains about 75km south of San Francisco.